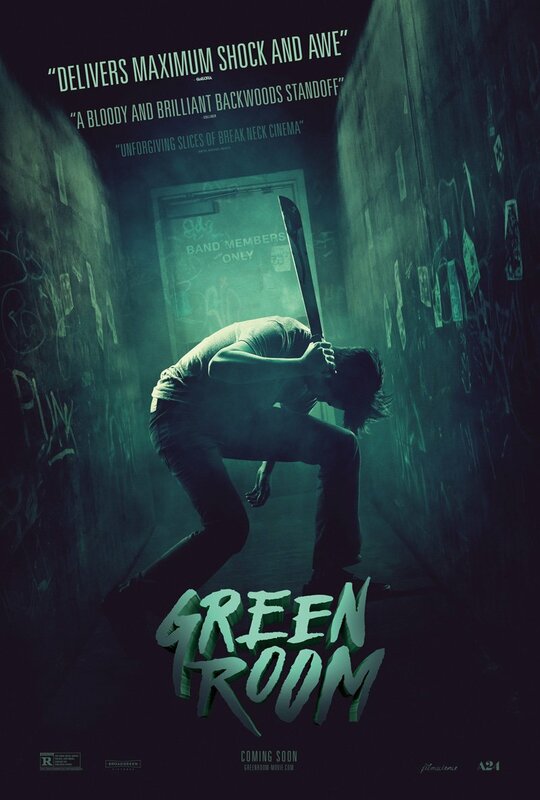 One week out from its theatrical debut and A24 (via Machinima) has unleashed a grisly red band trailer for Jeremy Saulnier’s Green Room and boy, it doesn’t pull any punches. In fact, the bloody sizzle reel does does stray into spoiler territory, so if you’re of the mindset that you want to go into Saulnier’s thriller with a relatively blank slate – a tactic we strongly recommend – then we’d actually advise against watching today’s new snippet. Steeped in a particular brand of horror, Green Room follows down-on-their-luck punk rock band The Ain’t Rights who, coming off the back of a miserable tour, find themselves in a backwoods dive bar headed up by Patrick Stewart’s gleefully evil owner, Darcy Banker. Without spoiling too much, things go from bad to worse to flat-out horrifying before long, and the titular Green Room quickly becomes the only safe haven for the band. Anton Yelchin, Imogen Poots, Alia Shawkat, Joe Cole, Callum Turner, Mark Webber, Eric Edelstein, Macon Blair and Kai Lennox round out the cast. Taut, shocking and dare we say it, visceral, our own Matt Donato heaped praise on Jeremy Saulnier’s backwoods thriller during last year’s Fantastic Fest. Buoyed by a wave of goodwill, Green Room is poised to make its bow across New York and Los Angeles next week, April 15, before expanding domestically on April 29. Down on their luck punk rockers The Ain’t Rights are finishing up a long and unsuccessful tour, and are about to call it quits when they get an unexpected booking at an isolated, run-down club deep in the backwoods of Oregon. What seems merely to be a third-rate gig escalates into something much more sinister when they witness an act of violence backstage that they weren’t meant to see. Now trapped backstage, they must face off against the club’s depraved owner, Darcy Banker (Stewart), a man who will do anything to protect the secrets of his nefarious enterprise. But while Darcy and his henchmen think the band will be easy to get rid of, The Ain’t Rights prove themselves much more cunning and capable than anyone expected, turning the tables on their unsuspecting captors and setting the stage for the ultimate life-or-death showdown.